We are thrilled that you are considering applying to WPI. As you'll see from our admitted student profile, admission to WPI is selective and competitive. We have high standards for applicants, but we look for more than just outstanding academic performance. Our approach to education is a little different from what you'll find at other schools, so it makes sense that we want students who dare to be different, who want to put their unique talents to work to make the world a better place, and who confront challenges by diving in headfirst to find a solution. 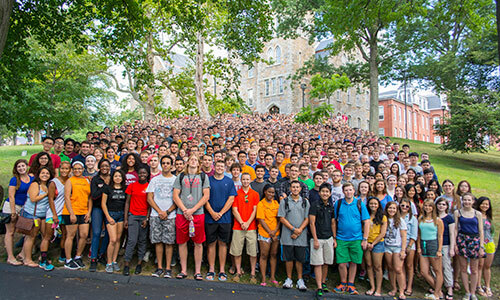 Who is a WPI Student? While every WPI student brings a little something different to the table, there are a few characteristics that they tend to share. Sound like you? Join us on campus to learn more and then get ready to apply! WPI is test-optional. Data only for students who submitted scores. Your application is your best chance to show us the real you and tell us what makes you a perfect fit at WPI. Here are a few suggestions to make sure your application is as strong as possible. Check out our college application timeline and checklist to stay on track and put your best foot forward in your application. Take advantage of all sections of the Common Application to share who you are and what makes you a fit for WPI. Be sure to check over your answers!